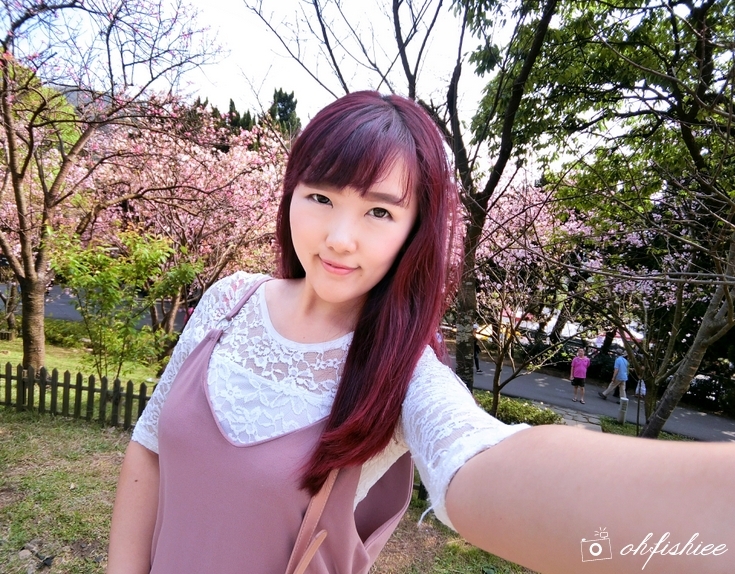 I'm so happy to be able to travel with my new camera to Taiwan this round! 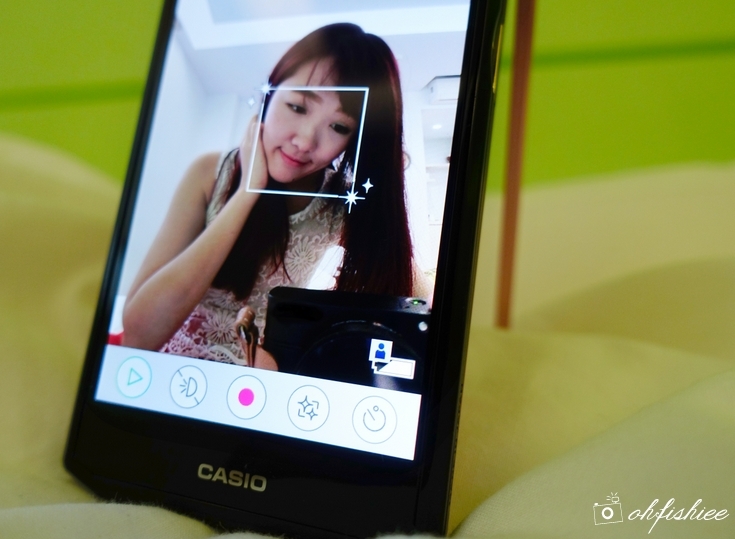 This cool pink gadget I am holding in the picture is the Casio TR80, the latest baby in Casio’s TR selfie-perfect camera series. It was just launched not long ago, and when I first got my hands on it, I was totally wowed by its beauty. 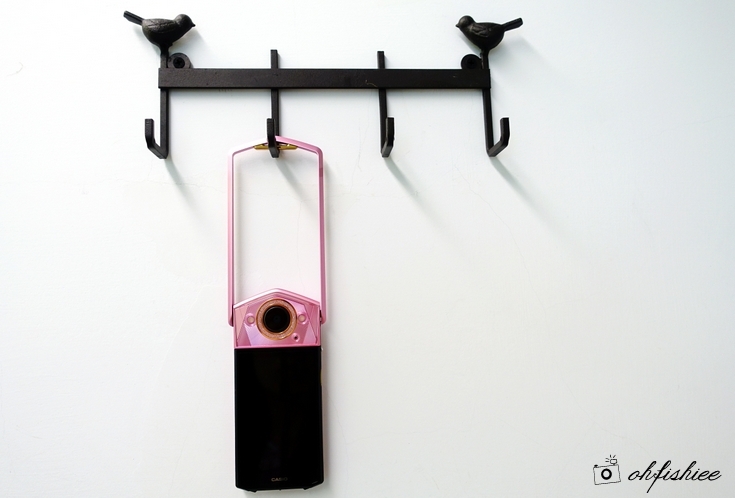 TR80 comes in Pink (the version reviewed), White and Black. And without any doubt, I choose pink! 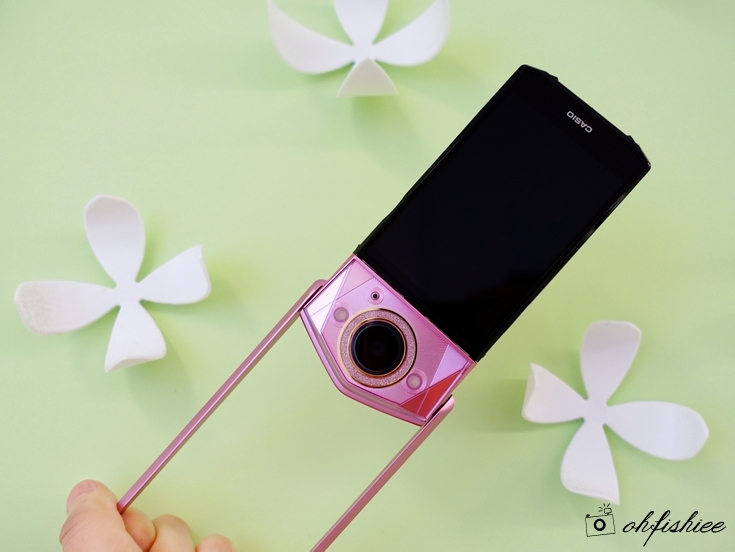 Let’s take a closer look at the overall design of the camera…. Design wise, TR80 is a love at first sight. 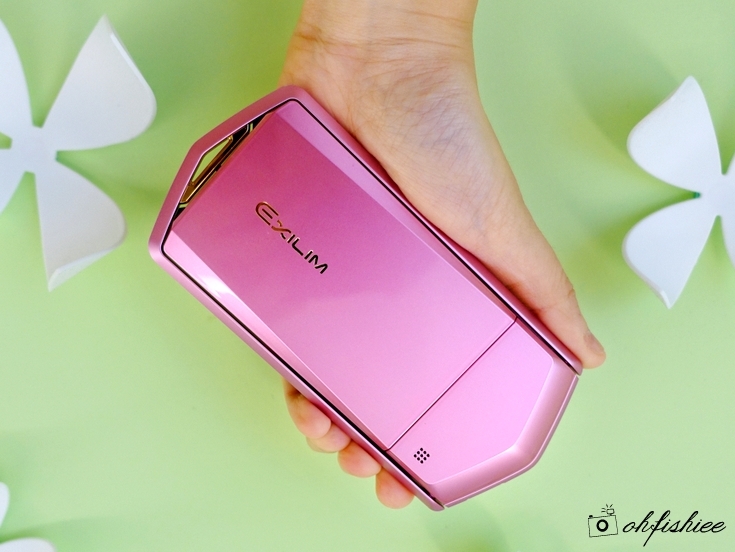 I really love the smooth metallic pink finish on the body that gives it a premium feel. It does not appear plasticky like the predecessor, TR60. And the ring of glitter gives the wide 21mm lens an added glamour. 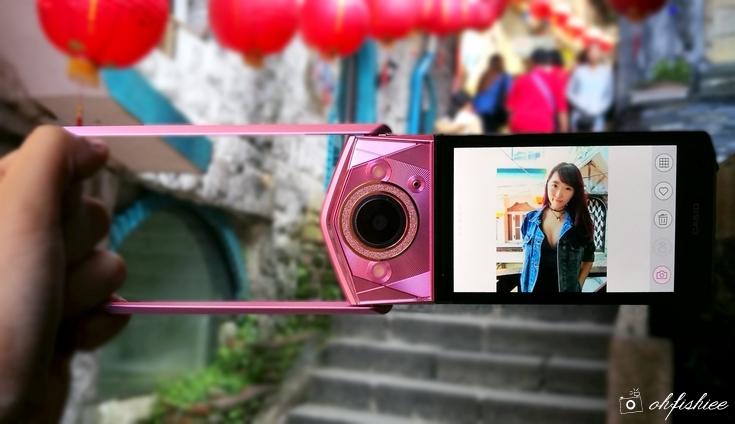 The rotatable frame, which I call the “handle” is so flexible that it can be rotated 360 degrees while the touchscreen display is rotatable by 270 degrees, hence the camera can be easily positioned to take pictures from all angles without getting any help from another person. Thanks to the flexibility, selfies can be taken at any possible angle. Sample picture I took using self-timer by placing the camera onto a flat surface. Hence, most pictures taken will be from low-angle, allowing a "long-leg" illusion. The size? To be honest, it is even smaller than my smartphone! The 16.7mm thickness makes it slim enough to fit into my clutch (works perfect for dinners!). The downside of the design? Shutter-release button on the side takes slightly more effort despite of the rotating handle. So why is it called a "Selfie-Perfect" Camera? Similar to the older versions of Casio TR series, it features 6 sets of beauty settings: Skin Tone, Smooth Skin, Face Brightness, Sculpting, Dark Circles Remover and Slim Face. 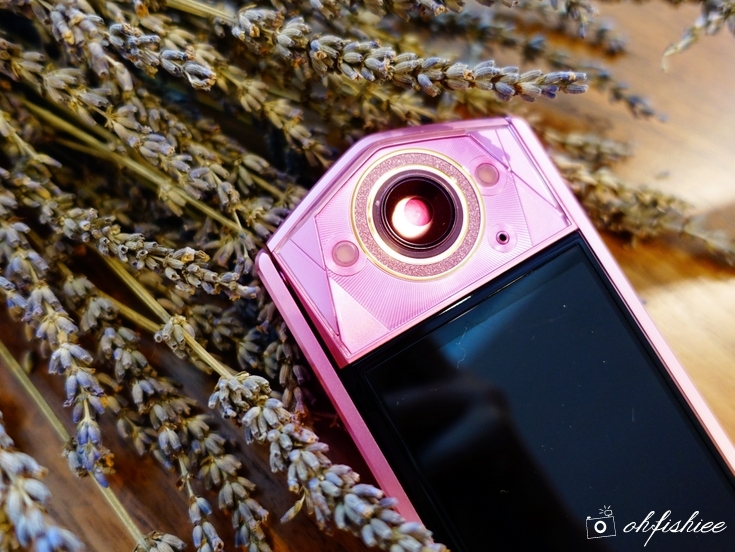 Well, we all know how beautiful the selfie is when taken using Casio camera, but I am glad that Casio TR*80 has more customization now, meaning I can have more natural-looking selfies. No more "overly beautified" selfies! The best part is, a similar beauty effect works when using Video mode too. Casio TR80 features double LED lights right next to the camera lens, which I really like! 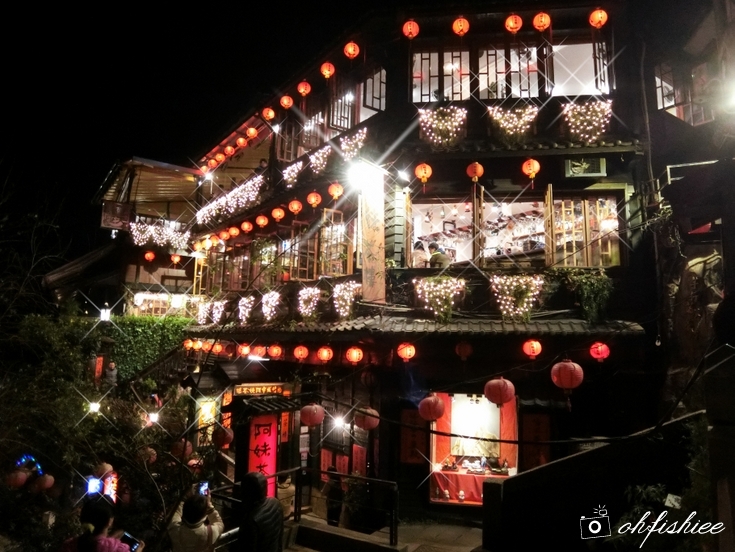 It brightens every picture you take even under dimmed environment. The result? More even exposure and no more "overly flashed" pictures. Again, the pictures appear more natural now! 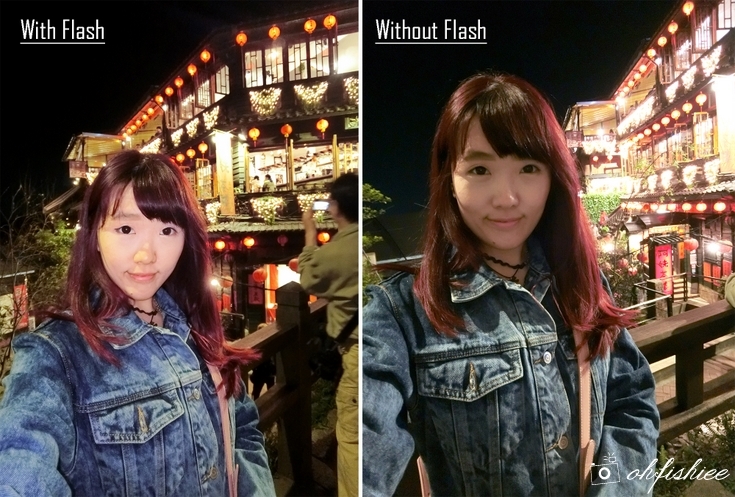 I prefer having both LED lights on to brighten the face (picture on right), rather than using direct flash like an ordinary camera. Throughout my vacation, I have also taken a lot of wide-angle selfies. Thanks to the wide 21mm lens, now I can see more of the scenery behind me. Love that cherry blossom shot taken using Casio TR80 because of the sweet “pastel” effect it gives! Wanna add some fun to your photos? Yes, it is readily available in the camera. No additional app required. I like the “sparkle” effect to give a fun touch to my night shot. Other special effects such as HDR, Black and White, and Selfie Art are worth a mention too. Picture taken with Sparkling Shot effect - It softens the overall image and adds points of light for a sparkle effect. Sample landscape picture taken during bright daylight using Auto mode. as the color composition appears rather dull and lack of contrast and vibrancy. 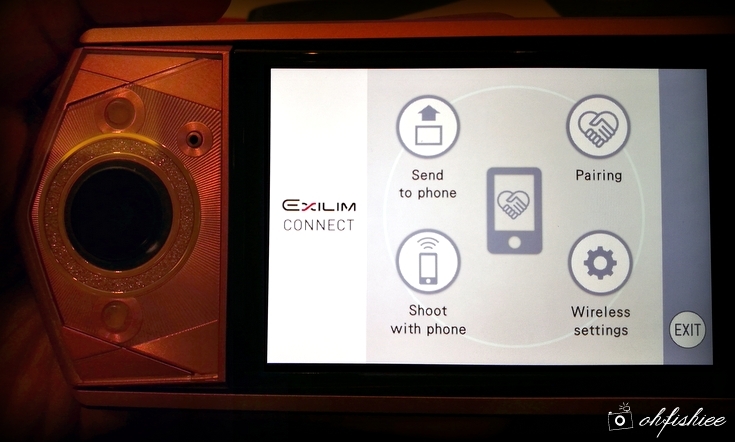 Another feature of the camera that is worth highlighting is the playback process – You can choose to connect your phone to the camera via Bluetooth and the phone will automatically receive the pictures once it is captured using the camera. In other words, I save a lot of time on transferring photos from camera to phone! I find this feature extra useful for instant uploading while travelling. 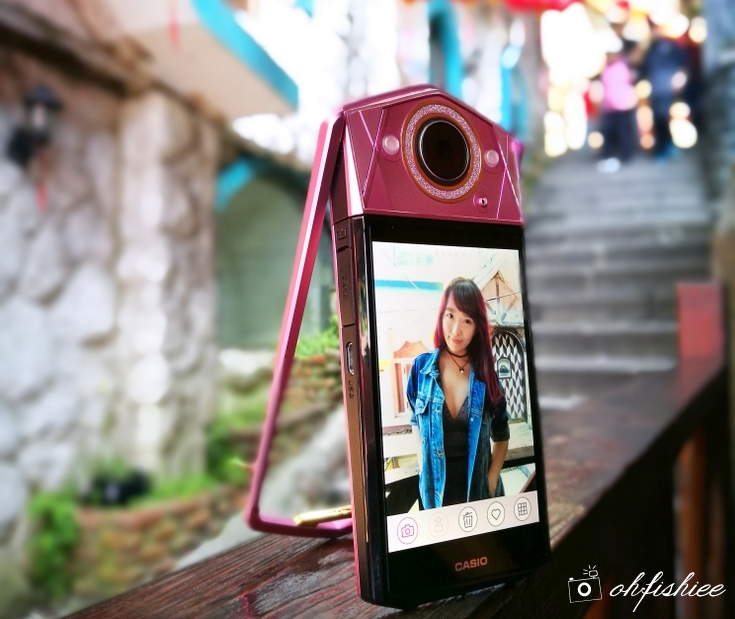 Overall, Casio TR80 is perfect for beautiful, wide-angled selfies. The easy-to-use interface is great for more customised beautifying effect, resulting in more natural selfies. However, other types of pictures such as landscape, food, close-ups etc may be lacking of vivid colors and contrast. Selfies / wefies can be taken at any angle you want. And the ultra slim design is convenient to bring wherever you go. To be honest, the battery life is kinda disappointed. It can take up to 255 shots, but the number is tremendously reduced considering the fact that I connect it to my phone for photo transfer and the heavy usage of flash lights. Luckily, I have my power bank with me so that I can always charge it while on the go. 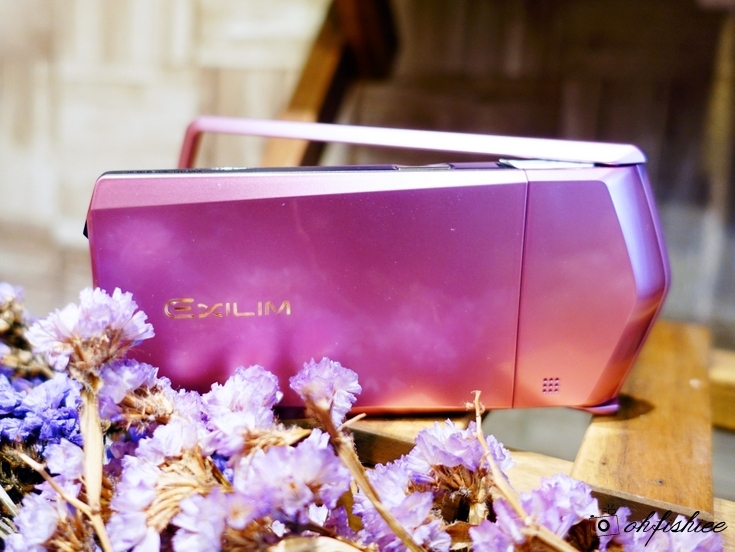 It retails at RM4,099 – it may not seem affordable for some. But with instalment payments offered via Lazada website, I think you can consider it as an investment without burning a hole in your pocket. It is indeed a selfie-perfect camera. 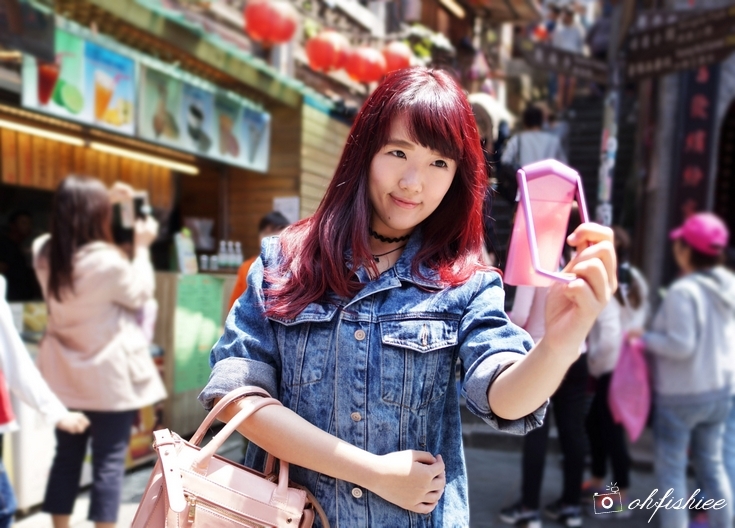 Great for selfie lovers and beauty vloggers as both still photos and videos come with beautifying effects. and GEM FIVE Malaysia Online Store.